The tactically-engineered Chase Low Shoes from Original S.W.A.T. 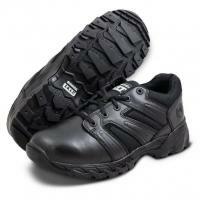 are durable, comfortable and offer a high standard of protection and foot support. The upper is constructed from leather and 1200 denier nylon. Reinforced stitching along the toe and heel, combined with a custom-molded thermoplastic toe box and heel counter, help to maintain its overall integrity and shape. The gusseted tongue keeps out excess dirt and debris, while its PU collar offers increased heat dispersal. The non-marking rubber outsole includes siping for maximum grip on wet surfaces, as well as ladder treads for climbing. The sole is highly slip and oil-resistant, allowing wearers to run safely across any terrain. The interior features a custom Phylon midsole which supports and cushions the foot, while the Texon stability platform provides lateral and torsional stability. A lightweight, airport-friendly nylon shank replaces the traditional steel of other shoes. Removable, custom-fit EVA orthotic, complete with PORON® cushioning pads, work together to reduce foot fatigue and provide all day comfort. The multi-functional lining is treated with AEGIS to prevent the build-up of odor-causing bacteria while wicking away moisture for lasting dryness. The Chase meets ASTM F2412-11 and F2413-11 standards for electrical protection.